Figure 1. A tool to restore reaching and grasping functions in tetraplegia patients. Tetraplegia is a type of paralysis caused by high-cervical spinal cord injury and can limit reaching and grasping movements. To restore the motor functions lost in these limbs, a tool known as the functional electrical stimulation (FES) applies spatiotemporal stimulation to muscles and peripheral nerves. This simulation has successfully restored grasping in individuals with mid to low level spinal cord injuries. However, it is challenging to restore grasping function in individuals with high cervical spinal cord injury. A system known as the Intracortical brain–computer interfaces (iBCIs) can plan the activity in the brain’s cortex and convert the desired movement in the patient, which eliminates the need for voluntary movement. Dr. A Bolu Ajiboye from Case Western University and his team of researchers examined a 53-year-old male tetraplegia patient, whose grasping and reaching movements were successfully restored via iBCIs, both effectively and intuitively. The participant’s voluntary shoulder movement was intact, but other voluntary functions, such as at the elbow and hand were not present. Two 96-channel microelectrode arrays were implanted into the hand area of the precentral gyrus region brain, which is a part of the motor cortex. Two procedures were implemented, one at 125 days and the other at 280 days after the implants. This included 36 percutaneous muscle-stimulating electrodes in right and upper arm, four of which restored function in thumb and finger. 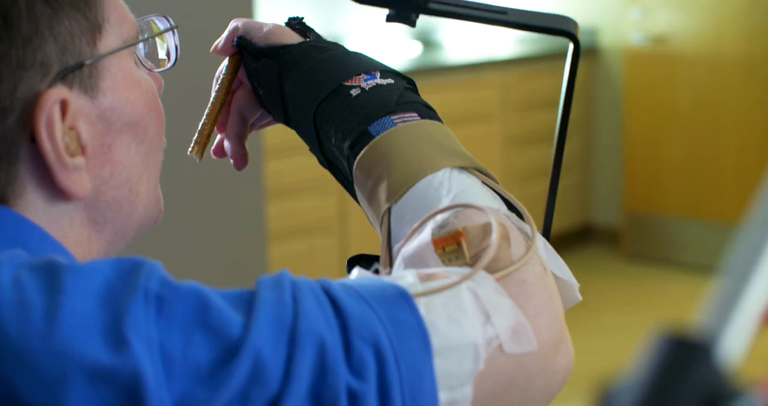 The participant was able to perform single-joint and multi-joint movements for point-to-point tests using a virtual arm before using his own arm. Overall, neural activity correlated with the subject’s intended movement, but the participant seemed to have achieved more target goals using the virtual arm than his actual arm. Certain failed attempts at reaching were attributed to muscle fatigue. Although iBCl has not restored movements at the same speed and precision of regular movements, it is still enough to perform relevant functions such as self-feeding. This study opens many doors for further iBCI research on paralysis patients by testing other intracortical electrode biocompatibility. Continued studies on the iBCl and FES advances can result in faster and more precise arm and hand movements. ← Can Fighting Malaria Combat Low Birth Weight?